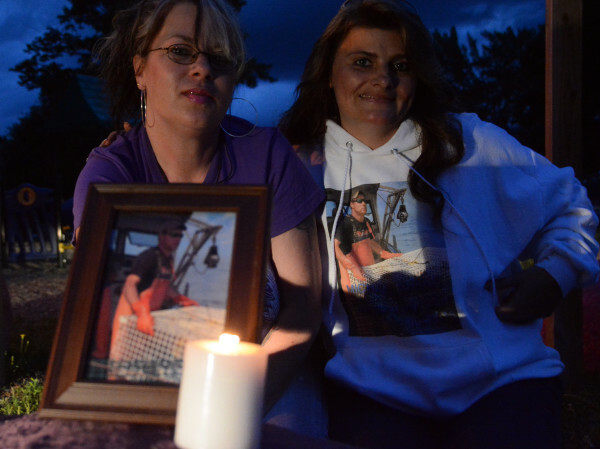 Leslie Perry (left) and Christi Woodruff, both of Corinna, brought a picture of Michael Ranke, who died of an overdose of heroin cut with the painkiller fentanyl, to a candlelight vigil in Lincoln. Aug. 31, 2016. Another year has gone by. Another year in which Maine is likely to again set a record for overdose deaths. And another task force has called for an urgent response to the crisis. This year’s report, like previous ones in Maine and nationally, recommends more effective prevention programs, better access to treatment, and more drug courts and jail diversion programs. We’ve known for decades that these steps are needed to combat substance-use disorders, but adequate funding for this work remains out of reach and lawmakers continue to divide limited resources among a diverse array of potential solutions, rather than focusing on what has been proven to work. For example, reams of research shows that medication-assisted treatment is the most effective way to ease substance abuse. It also saves money, primarily by reducing incarceration. But the biggest hurdles to increasing this treatment remain unaddressed. While Maine’s Medicaid program, known as MaineCare, covers all three Food and Drug Administration-approved medications to treat opioid addictions, it limits access to the two most common medications — methadone and Suboxone — by initially limiting Medicaid patients to two years on the medication. It is one of only 10 states with a time limits on Suboxone treatment. Such time limits apply to no other medications, and there’s no scientific evidence showing that addiction patients should be time-limited. Gov. Paul LePage signed this hurdle into law, and his administration has opposed eliminating it. Maine has one of the lowest reimbursement rates in the nation for addiction treatment providers who treat patients who use Medicaid for health insurance. Maine’s $60-per-week reimbursement for methadone clinics has affected the quality of care at some clinics by limiting the amount of behavioral counseling available. Coupled with the misguided two-year limit on medication-assisted treatment, this low rate puts the ability of many clinics to provide effective care for their patients in doubt. Last year, legislation to raise the reimbursement rate passed both chambers of the Legislature, only to die for lack of funding. The voter-approved expansion of Medicaid could also help increase access to treatment. The expansion will extend health insurance to about 70,000 Mainers, most of whom are working but don’t currently qualify for Medicaid or subsidies to purchase health insurance through the individual market. Many of these people are currently dealing with substance abuse disorder but are unable to afford treatment. Lawmakers had previously approved an expansion of Medicaid to cover more low-income Mainers but LePage vetoed it five times. Voters in November approved the expansion, with 59 percent of votes in support. Since then, LePage has been making excuses for not implementing the expansion, which will bring in more than $500 million in federal funds each year when fully implemented. When Portland Police Chief Michael Sauschuck appeared before the task force, he was asked what single thing the group could do to best address the increase in overdoses. Expand Medicaid, he responded without hesitation. Maine doesn’t need more task forces and reports. It does need urgent action — to remove barriers to treatment. Expanding Medicaid, raising reimbursement rates and eliminating time limits on treatment are solutions that can be implemented now, if lawmakers have the will to do so.